Display problems? / Weergaveproblemen? View in browser / Bekijk in browser. Great news! 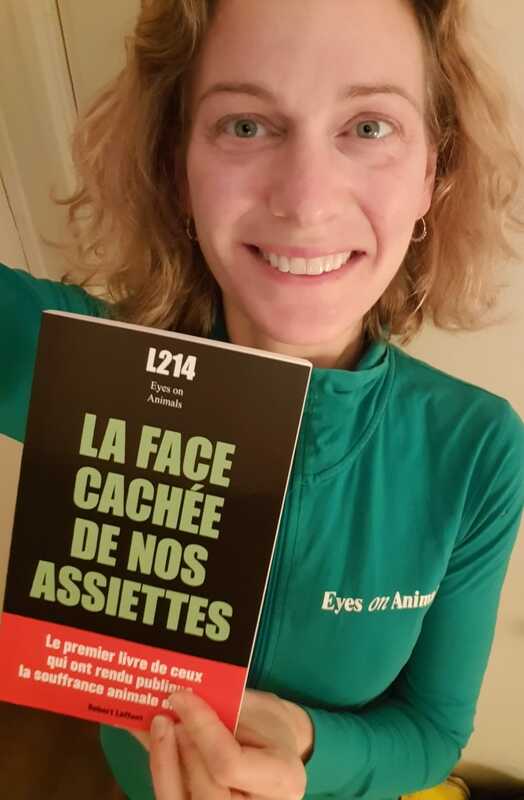 This week our book, La Face Cachée de Nos Assiettes (The Hidden Reality on Our Plates), published by the well-known French publishing house Robert Laffont, came out in stores ! The book is for sale in all major French bookshops and on Amazon. The book, written by Eyes on Animals and the French animal-welfare organization L214, is already a big success. Sales are running like a train - which means that a large audience is becoming familiar with how animals are transported and slaughtered. In 2017, publishing house Robert Laffont heard about Eyes on Animals - as a small organization with a huge impact on the agricultural sector. Lesley, our director, immediately said “Yes!” when she was asked by the publisher to write a book together with colleague organization L214. In the book you can read about the inspections carried out by Eyes on Animals and L214, their motives and the tough but also successful moments in their work. This week, Lesley from Eyes on Animals and Sebastien and Brigitte from L214 were interviewed on one of the most listened to radio stations in the world: Radio France Internationale (RFI). RFI has 36 million listeners, including francophone countries in Africa. Listen to the interview here.